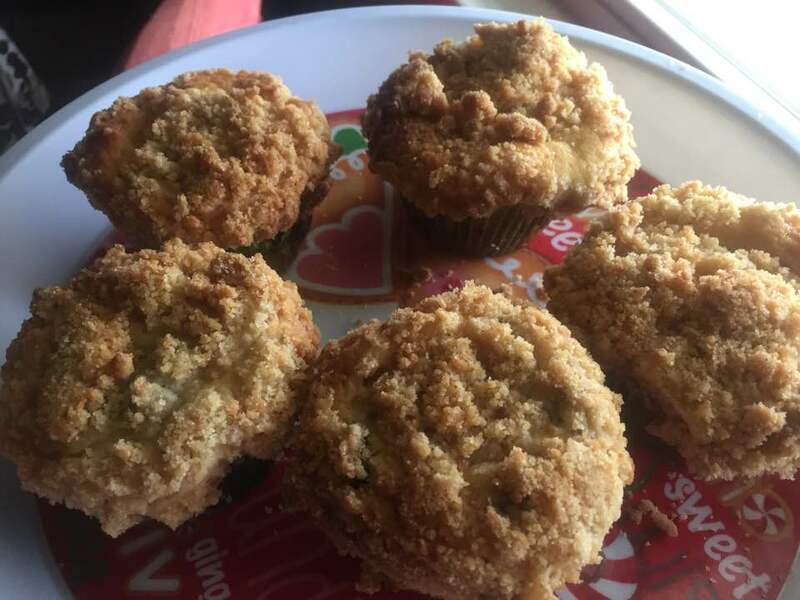 While there wasn’t a cinnamon-y muffin recipe — which is what I had signed up to bring — there was a cinnamon coffee cake recipe, and it explained how to change up the recipe (really just cooking time) for cupcakes. It didn’t include chocolate chips, though, so I just made one batch without chocolate chips and then added them into the batter before spooning it out into the second muffin tin. You can make the streusel ahead of time if you’d like. Just mix all of the ingredients together and use a spoon (or your hands, or a pastry cutter) to cut the butter into the dry ingredients until it’s like a crumbly powder. Preheat the oven to 350. Line the muffin pan with liners or grease with cooking spray. With a hand or stand mixer, cream the butter, 1 cup of granulated sugar and the brown sugar. Add the vanilla and orange flower water and beat for 30 more seconds. Scrape the sides of the bowl. In a medium bowl, whisk together the baking powder, salt and flour. Gradually add half the flour mixture to the butter mixture, then half the cream fraiche and 2 of the eggs. Then the rest of the flour and then the rest of the creme fraiche and eggs. If you’re going to add the chocolate chips now’s the time. Gently fold them into the batter. We used dark chocolate morsels and they were a great fit. Fill each muffin container halfway with batter, spooning it in. In a small bowl, mix together the remaining 1/4 cup of granulated sugar, the cinnamon and 1/4 cup water. Using a plastic knife or chopstick, cut a zig-zag pattern in the batter, then pour the cinnamon mixture on top. Spoon in the rest of the batter to cover. Sprinkle the streusel on top and bake for 25 to 30 minutes. Muffins are done when a toothpick inserted into the thickest part of the muffin comes out dry.